MANILA, Philippines —The Philippines commemorates the 43rd anniversary of former President Ferdinand Marcos’s declaration of martial law on Sept. 23,1972. 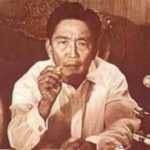 During the full implementation of martial law under the Marcos regime, several institutions and media outlets were closed down, officials and citizens were arrested and there activists were killed. Martial law officially ended Jan. 13, 1981 while Marcos remained in office until the historic EDSA People Power Revolution in 1986. Here’s a look back, by the numbers, at the day when Marcos proclaimed martial law 43 years ago based on the infographic from the Official Gazette. 7: Public utilities were closed including the Manila Electric Company, Philippine Long Distance Telephone Company, National Waterworks and Sewerage Authority, Philippine National Railway, Philippine Airlines, Air Manila, and Filipinas Orient Airways. 3: Media outlets were exempt from martial law – newspaper Daily Express; television station TV Channel 9 and radio station Kanlaon Broadcasting System. Around 60,000: estimated personnel from the Armed Forces of the Philippines were alerted. 4: Senators were arrested which include Benigno “Ninoy” Aquino Jr., Jose “Pepe” Diokno, Ramon Mitra Jr. and Francisco “Soc” Rodrigo. Approximately 8,000: Individuals were also arrested. Among these are the 1971 Constitutional Convention delegates, journalists, students, labor leaders and a few members of the elite families. 12: Iglesia Ni Cristo security guards were killed. All of these numbers happened in one day according to reports.